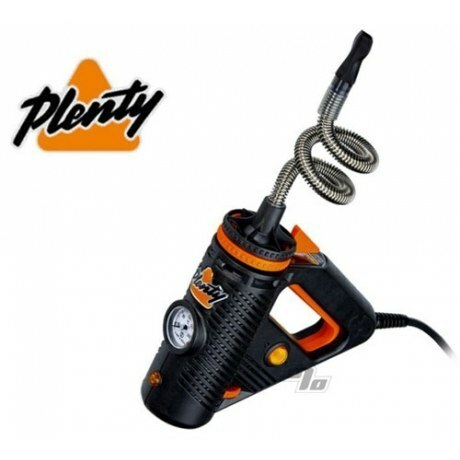 The PLENTY Vaporizer is the one and only hand held vaporizer from Storz & Bickel, the inventors of the Volcano Vaporizer. The PLENTY was designed from the ground up to be a perfect hand-held vaporizer. The PLENTY Vape uses a standard AC power adapter, with a cord that plugs into the closest wall. Some might not consider the Plenty a "portable vaporizer" with the cord, but it's small and easy to move around and no batteries saves weight and hassle. Weighing in at only 1.5 pounds and measuring 6.1” (L) x 8.86” (H) x 2” (W), it is one compact and silent vaporizer. The unit is considered a 'direct draw' device with a flexible stainless steel coil attached to a mouthpiece. The coil can be bent to the position that best suits the user and also cools the vapor during use. Vaporizing temperatures within the PLENTY's filling chamber start at 266 F (130 C) and go up to 395 F (202 C). The device's current temperature is displayed via an easy to read and precise analog thermometer. Temperature can be easily adjusted with the orange click-dial. The bi-metallic temperature regulator ensures safe operation and prevents the vaporizer from overheating with an automatic shut-off feature. Just like its predecessor, the Volcano Vaporizer, the PLENTY is German engineering at it's finest. All construction has been built upon food-safe and aroma-free materials for the healthiest vapor possible. 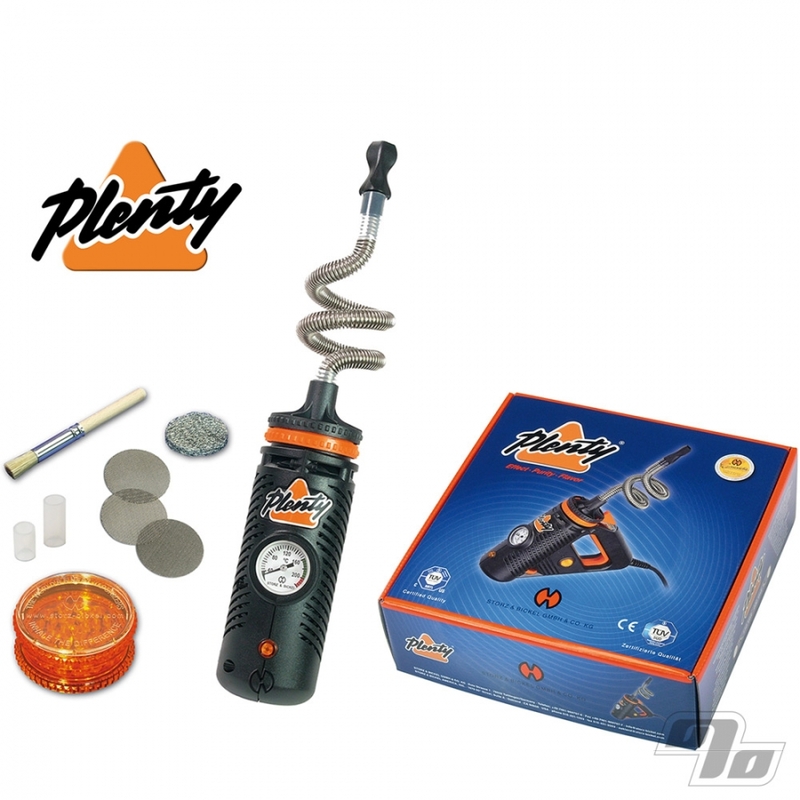 The PLENTY has also been certified by the German TÜV and NRTL. The PLENTY focuses on what matters the most: vapor. No gizmos here, the PLENTY's functionality and simplicity guarantees an impressive vaporizer that produces amazing vapor. Storz & Bickel warranties the PLENTY for 3 full years when purchased through an authorized distributor. This item can only ship to the address listed on your credit card account -or- can be paid for in advance with check or money order. Discounts not applicable on Volcano products as per manufacturer requirements. When I ordered the Plenty vape, I was somewhat apprehensive, as I'd already purchased 4 other systems that didn't do the job. Especially disappointing was the V-Vape2, a Cannabis Cup winner that must've been the only contestant that year. Just more of the same tired heating coil technology that is inefficient, at best. The Plenty, however, is in a different class of system and really does a great job. The simplicity of use is a plus and I will highly recommend 1% and this system to others looking for a superior product and great service. I bought the Plenty Vaporizer because I also own the Volcano. The Plenty is easy to use, easy to clean and creates a smooth vapor quickly. Well built a good investment. #1 Vapor quality is amazing!!! Great for solo use with fast heat up. Large herb chamber but also works great with a small amount of herb. Funky looking but performs better than any other whip type vaporizer I've ever used. Vaporbrothers, Silver Surfer, etc have nothing on this professional vape.